Don't Get Exhuasted | Tennessee Aircraft Services, Inc. In the normal course of small aircraft maintenance we pursue issues related to keeping the engine, systems, equipment, or structure in proper operating order to avoid some catastrophic failure of that component. The exhaust muffler used for cabin heat is one exception. It can fail with large chunks of material missing and the engine continues to run just fine (a few decibels louder). A smaller failure, like a crack gives no audible warning but the danger is most certainly catastrophic. The passengers and crew is totally oblivious to the imminent corruption of their oxygen supply. Ensuring the integrity of the exhaust system is a very simple and inexpensive process. Unfortunately it is often not fully investigated. Due to extreme thermal changes and system design limitations the exhaust system is not 100% sealed in the areas outside the cabin heat exchanger. Minor leaks in these areas are not usually a major concern. 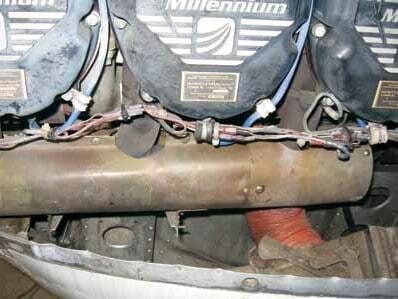 The heat exchanger is basically a muffler with a metal shroud around it to channel outside air through it to the cabin. The air is heated as it passes over the muffler within the shroud and is then sent on to the cabin as the crew has selected. Any leak of any magnitude from the muffler inside the cabin heat shroud is unacceptable. The Visual Inspection: This should be done any time and every time the exhaust system is visible either to the pilot/owner or mechanic. 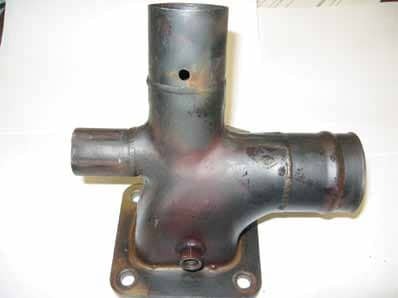 One would look for white or light smoky colored residue, possibly on the cylinder fins or where exhaust pipes connect to other exhaust pipes. Orange discoloration on the stainless steel exhaust pipes, particularly on turbo charged engines which can produce much higher temperatures, is also sometimes visible. This can also be noticed at slip joints and EGT probes. Cracks often begin at edges of welds and weld seams. The end caps of the mufflers where the pipes are welded is stress point to watch. Orange and red stains indicating some high temperature exhaust leaking from the EGT probe. The Ring Test: When tapped with a metallic object such as a small hammer or other similar sized metal object, stainless steel exhaust pipes that are in good serviceable condition will make a nice tinny, ringing sound. If the stainless exhaust erodes or corrodes on the inside of the pipe to the point there is a problem, the sound will be more hollow even to the point of a thud. 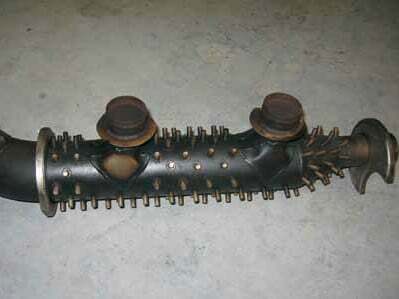 The most likely areas problems arise initially are on the outside curve of the pipe bends. There is a reason for this. When the pipe was manufactured, the inside of the bend’s wall is increased slightly while the outside of the bend is actually stretched and thinned. During engine operation, the flame patterns tend to create more heat in the outer radius of the bend. The combination of the thinner wall and higher heat contributes to this area being the higher wear area and thus, the first place a problem may appear. 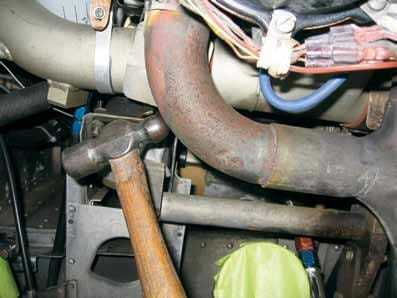 The Pressure Test: One of the best exhaust system integrity checks is the use of air pressure. Many imperfections not visible and not detectable using the ring test can be exposed by simply applying air pressure to the inside of the exhaust and looking to see where it comes out. A shop vac or any air source capable of high volume and low pressure works well. The outlet end of Grandma’s old Hoover vacuum works very well, but be sure it’s clean. If you’re quick, she’ll never know it was missing. A short piece of old airplane tire inner tube makes a good interconnect between the vacuum cleaner hose and the tail pipe of the exhaust. Clamp both ends of the inner tube with appropriate sized hose clamps and turn on the vacuum. While the system is under pressure, use a spray bottle to apply a simple solution of water and liquid dishwashing soap (not the machine style soap). Any leaks will show as bubbles thus highlighting even extremely small leaks. Orange and red stains around the turbo charger flange. The pressure test procedure is required by FAA Airworthiness Directive every 50 flight hours on certain models of the Cessna 210. If modified with a particular replacement style exhaust system, that time interval may be increased to 100 hours. Compliance with the AD for the 210s must be performed by an A&P mechanic. However, there is no regulation that says you can’t do this very same check on your airplane any time you want as form of preventive maintenance. I believe this should be performed on every heat exchange muffler every 100 hours of operation, whether by a mechanic or the owner. 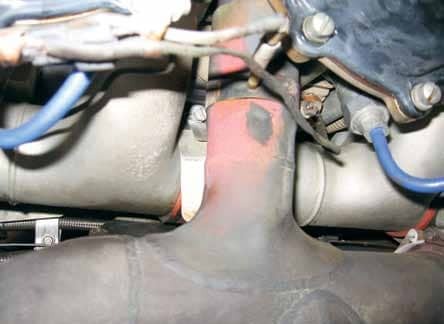 If you do this check as the non-certified mechanic, have a certified A&P mechanic inspect the reinstallation of the heat shroud as its correct placement and security is critical to the safety of the system. Carbon monoxide detectors: Another highly recommended safety precaution in this area is the use of a carbon monoxide detector. A detailed discussion of features, types and brands is beyond the scope of this discussion. However, a unit that gives an audible alert and a digital display in parts per million would be minimum requirements. I recommend checking the various aviation consumer groups and of course your own Cessna Pilots Association forum for information leading to the unit best suited for you. 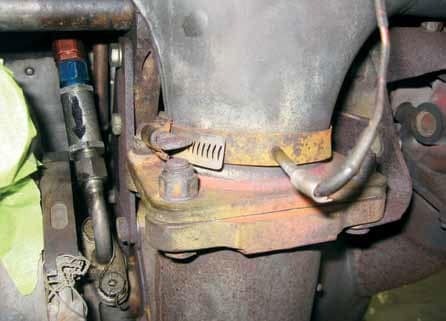 The heat exchange shroud around the muffler on the left side of a P210. The muffler from left side of a P210 without the heat shroud. Note all the “heat studs” for transferring heat to the air flowing past. Cheesy article title aside, ensuring the integrity of the exhaust system is a no compromise issue. Most planes are on 50 hour oil change cycles so adding the exhaust inspection to every other oil change is an easy add on. Performing these simple inspections and checks are incredibly inexpensive and yield untold returns. Show your passengers you care by providing wonderful fresh air to match the beautiful scenery of the flight. My “calibrated” hammer tapping on the outside radius of an exhaust pipe listening for a good ring. A Cessna 400 right side turbo transition after removal. A close look will reveal a crack but no visible indication.